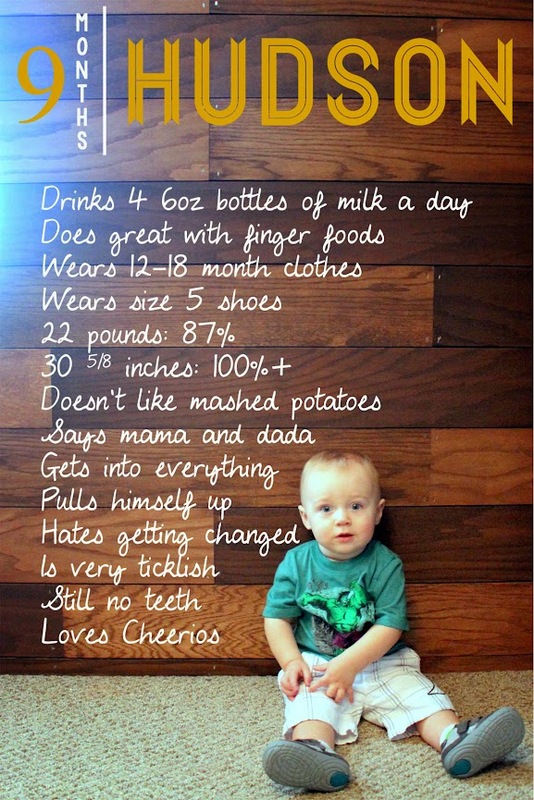 My sweet Hud is 9 months old!! I cannot believe that I will start planning a 1st birthday in the next month or so. He is still growing like a weed planted in Miracle Gro. He went to the doctors on Christmas Eve with pink eye and turned out he had an ear infection to. Since he was already there, they decided to just go ahead and give him his 9 month check up. He is 22 pounds, putting him in the 87% percentile for weight and 30 5/8 inches tall, putting him in the 100%+ percentile again. He is the same height at many kids that are older than him (which isn’t shocking considering Chris is so tall) but still funny none the less. People are always shocked to hear he isn’t one yet. You definitely feel like you should be able just put him down and watch him walk away. He is still wearing size 4 diapers and 12-18 month clothes for the most part. Depending on the cut and style, he can still wear some 12 month clothes but we mainly buy him 18 month+ now. He even wears some 2T pjs, however, I must say they run super small. He is wearing size 5 shoes, which by the way, we are trying to get better at wearing. He likes to curl up his toes when I put them on but he is still more and more used to it. He is still my little eater! He still takes 4 bottles a day, although I think in the next month we will drop the first bottle in the morning. He has 3 meals a day of purred food but we are now offering him finger foods along with it. The other day he had some of Kyler’s chicken and he ate it right up. He even had prime rib on Christmas Eve! The only thing I have found that he absolutely refused is mashed potatoes. SO WEIRD! He gags on them and shakes his head no. I don’t know if it’s the texture or taste but it’s just weird. His bottom gums are super swollen right now so I know some teeth are about to make their appearance which will help with all those finger foods. He loves Cheerios now! He can put away quite a bit 🙂 He isn’t the best with sippy cups we are are working on it! Well it may have taken him a while for him to crawl but man, once he started he hasn’t slowed down. He gets into everything! He pulls himself up on to everything and anything and has no fear. He holds onto things with one hand. It’s funny because when you put him down he just takes off. Definitely on a mission. He finally started saying mama after only saying dada for a while. The other day, he picked up a ball and held it up to show me and said ba! I think he starting to get it! He is such a good baby. He is just so relaxed and happy most of the time. He is so sweet and loves to snuggle. He is very ticklish, just like mom and big sis. He will go to pretty much anyone with no fuss. Hudson smiles and laughs a lot and is a lot of fun to be around. He loves bath time but hates getting changed! He just screams when you try to put clothes on him. Probably because he has to sit still! He has pretty sensitive skin right now. I just switched his soap to a even milder soap and have been using some lotion on his legs to try and help with the little bumps (I think eczema). Happy 9 Months sweet boy!!!! !